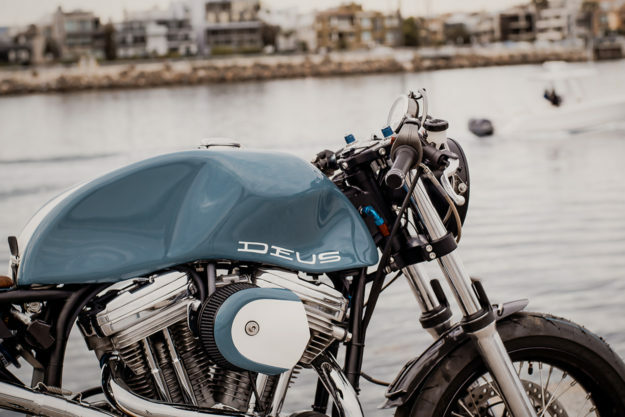 It’s usually a long time between builds from Deus’ L.A. workshop supremo Michael Woolaway—but they’re always worth the wait. 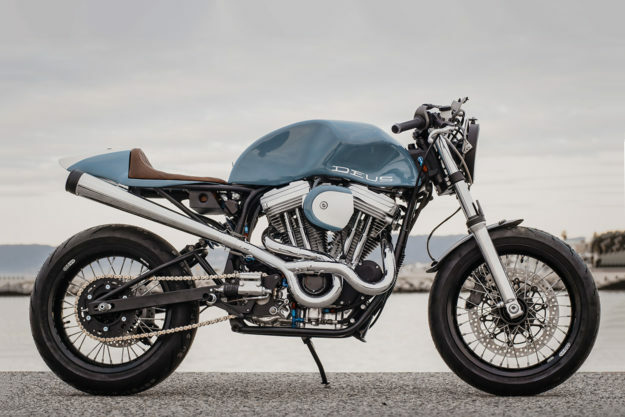 Like this seriously hot rodded Harley cafe racer, the ‘Bel Air 1200 Framer.’ It’s got more curves than a racetrack, and enough grunt to spin the wheels at will. Woolie’s owned a few Bel Airs over the years, and once had a shop in Hood River, Oregon, where he restored them—along with straight-axle Corvettes. And that’s where the bodywork curves and the gorgeous paint come from. Shot by Matt at Anaheim Rod and Customs, it’s close to Chevrolet’s ‘Tropical Turquoise’ shade. “We went shopping for the base colors to mix this color,” says Woolie. “I have found it’s much better to mix your colors, as you can control it—and you are never surprised in the end. Rake is around five inches less than the showroom 1998 Sportster too, although trail is only a smidge tighter. The frame is about half the weight of Milwaukee’s original, and much stiffer. 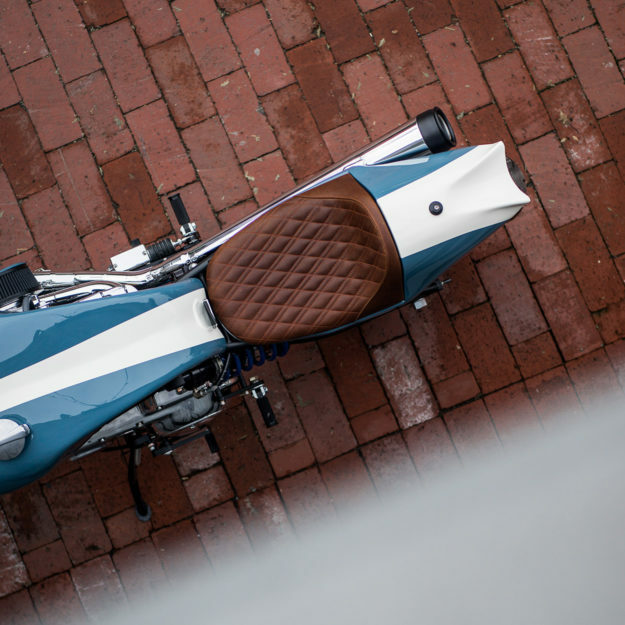 The 1200 Evo motor is not short of torque. Still, Woolie’s given it a shot in the arm with a blueprint rebuild and ported heads. 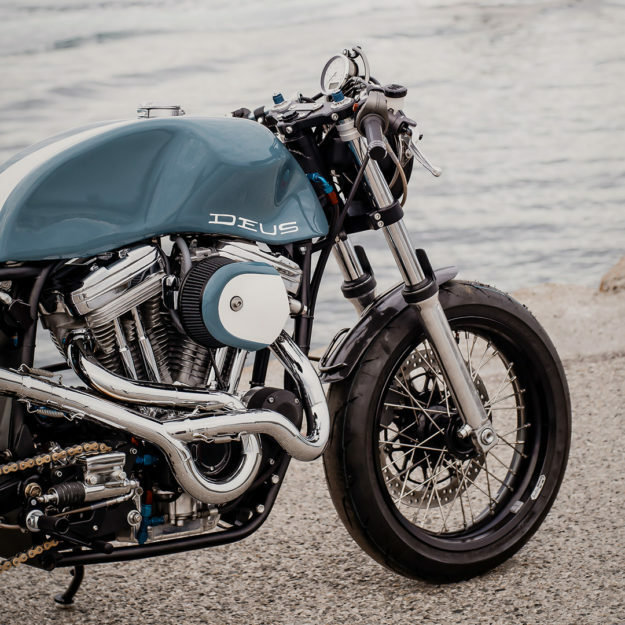 Fuel enters via a Keihin FCR-39 flat slide carburetor hooked up to a K&N air filter, and a Daytona Twin Tec ignition system keeps everything in optimum tune. Those snaking stainless steel exhaust headers were made in-house, along with one of the longest megaphone mufflers we’ve ever seen. 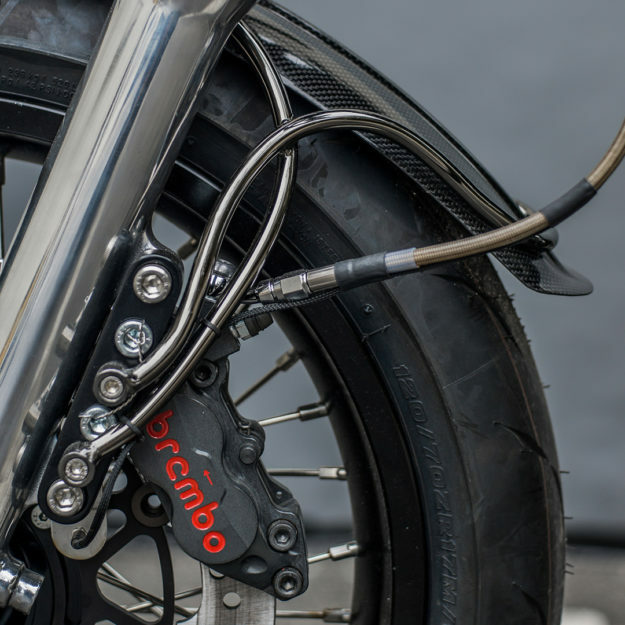 Suspension designed for cruising isn’t going to cut it on this kind of bike, so Woolie has grafted on a pair of 43mm Yamaha YZF-R6 sportbike forks. 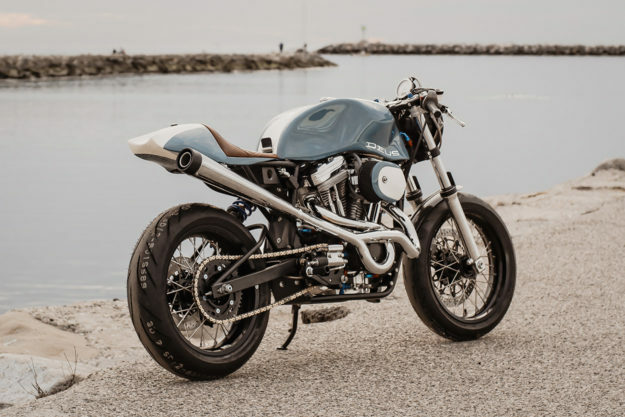 At the back, on the left side, there’s a Race Tech monoshock coupled to the custom swingarm. Everything was rebuilt and tailored to the weight of the bike and rider by former Race Tech R&D specialist Jimmy Wood, now at Moto Station. 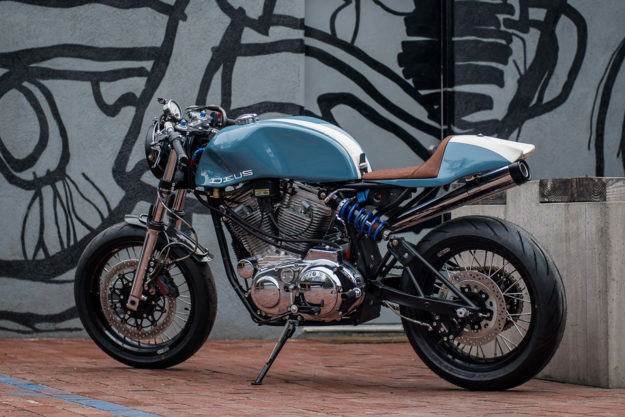 ‘Bel Air’ rides on super-sticky Bridgestone Battlax Racing rubber. Sun rims and spokes are hooked up to Rad hubs, with stopping power comes from oversized Brembo brakes and a Magura master cylinder. The most visible craft is in the bodywork though, shaped by hand from aluminum. 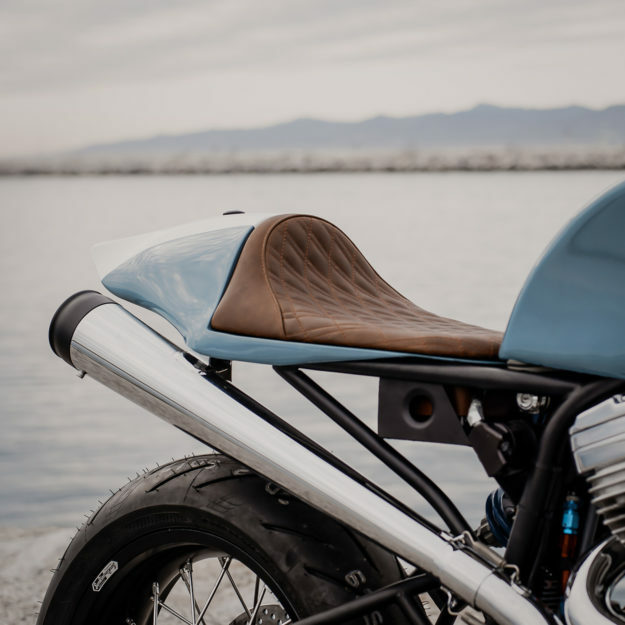 The heavily creased tank is topped off with a large vintage Monza gas cap, and since the bike is designed to be at home on the track, the rider’s knees get substantial indents to grip. 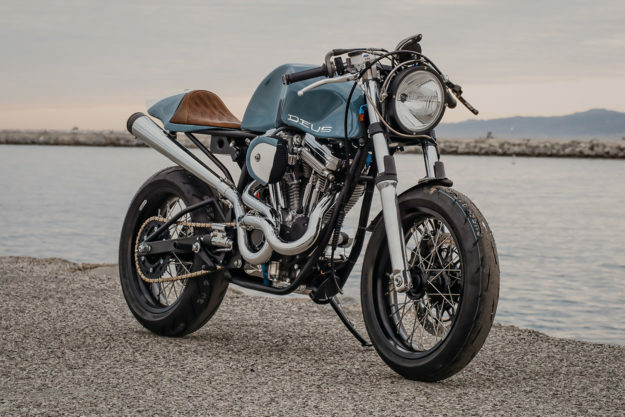 Woolie famously doesn’t own a road bike, and his single-minded pursuit of performance shows through in every nook and cranny of this build: ‘Bel Air’ is perfect for blasting through the L.A. canyons, as well as cruising along Sunset Strip.